Three concertos spanning the career of the extraordinarily productive Gunther Schuller who — amidst a life as composer, conductor, performer, educator, administrator, musicologist and author — has found time to compose twenty concertos. 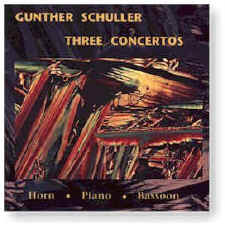 Three Concertos spans works from Schuller’s very first effort along with one from his middle years and from a more recent effort. In classic performances by the Cincinnati Symphony Orchestra under the baton of the legendary Max Rudolf as well as the Saarbrücken Radio Symphony Orchestra conducted by Maestro Schuller himself, Three Concertos presents diverse and exhilrating concerti for horn, piano and bassoon and orchestra with soloists Richard Todd, Jeanne Rosenblum Kirstein and Kenneth Pasmanick, respectively.